Hatters boss Nathan Jones was glowing in his praise for strike duo Danny Hylton and James Collins after they both scored in the 2-0 victory over Barnet on Saturday. Hylton was on target first, netting his 18th of the season and first since January 6 at Newcastle United after an injury-hit spell, nodding in from a yard out after Dan Potts’ wonderful header back across goal from Alan Sheehan’s free kick. On his striker's return to the scoresheet, Jones said: “I’m glad Hylts has scored as he’s had to re-find his rhythm again because of injury. “That’s what people forget, so they say eight without a goal but it’s not. Danny’s come back in, he was injured, he plays through injury, he’s a warrior and he tries to come back quickly as he wants to help the team. 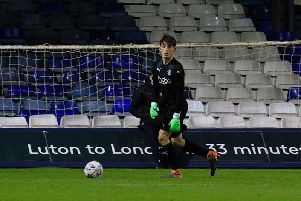 Meanwhile, Collins’ angled volley that burst through the gloves of Bees keeper Craig Ross was his 19th of the season and a sixth in the last seven games. When the pair have scored this term, Luton haven't tasted defeat, as Jones continued: “In everyone else’s absence, Collo has been a real pivot for us and a real one that has taken big strides. “He wants to score goals, he’s led the line for us and I’m proud of him as well. “The keeper probably could have done better with that one but he’s done wonderful from a lot. “We’ve had chances, Scott Cuthbert’s had a real good chance from a header, we’ve had enough chances to have made it more comfortable. With just seven games to go, the pair are now locked in a battle to finish as the club’s top scorer, which is the perfect way to drive them on according to midfielder Alan McCormack. He said: “Him and Collo have got a great rivalry together as they both want that golden boot, they both want to be top scorer, both want to be to the team’s top scorer and it’s a very healthy rivalry. “There’s no nastiness in it, you can see how well they worked, into one’s chest, popped off for the other, they were both on top form and we need that for the last seven games. “Jervo (Jake Jervis) and Elliot Lee were very disappointed not to come on or start the game, so the boys in the dressing room are just itching to play and you can see the disappointment. Meanwhile, keeper James Shea added: "They're going strong them two. He’s a massive player for us Hylts, a massive player, if he scores the team will do well. "We’ll always score goals, you look at our front players, we will always score goals."